This tray is ideal for phone repair, crafting or anything that requires sorting of small pieces. Store a standard size smartphones in the side compartment, place tools in the bottom compartment and organize screws and parts in the small compartments. The tray is made of anti-static plastic making it safe for delicate components. 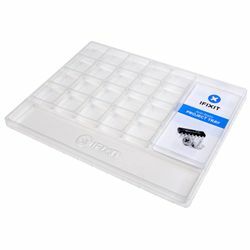 Screw maps are available at ifixit.com for many popular repairs like smartphone battery and button replacement. Just place the map under the project tray so you can keep track of each individual part for reassembly.